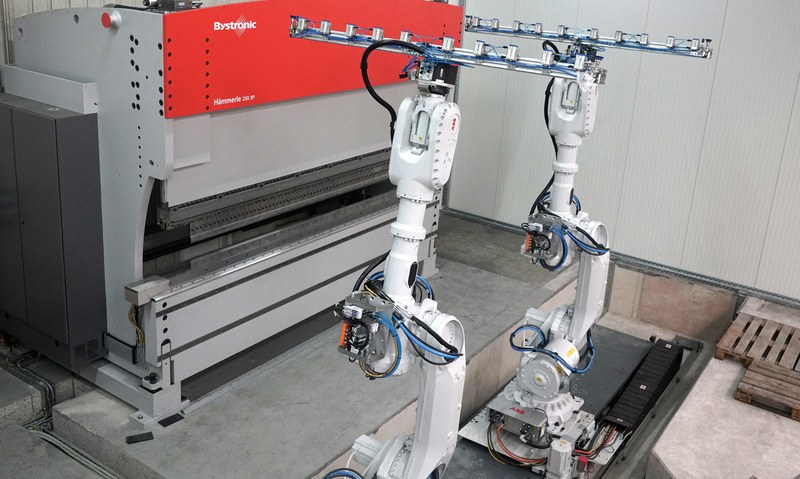 As part of our modern machinery set-up we have high performance press brakes in line with the latest technical standards, for the precise forming of sheet metal components in our modern machine park. These machines permit us to shape smooth boards for all kinds of components, at low cost and with great repeatability. Overall, we awere able to provide the company Beyerle with press-bended or air-bended components of up to 4,100 mm in length with our hydraulic press brakes. The maximum press force available for this purpose is 3200 kN (320 t). To achieve even greater productivity with simultaneously low material waste, the edge programmes are programmed offline. Ensuring high efficiency to reduce costs and save energy is an important aspect of our customer philosophy. The top performance of our machines is associatedgoes hand in hand with the strong performanceexcellent work of the employees responsible, who think and act in a solution-oriented manner in the interests of our customerswith our customers’ needs in mind. Ensuring high efficiency to reduce costs and save energy is an important aspect of our customer philosophy.